If you study the habits of any gardener who has wonderful looking plants and shrubs, you will know that proper pruning is a key to their success. These pruning tips will help you make sure that your shrubs and garden plants will look their best, season after season. 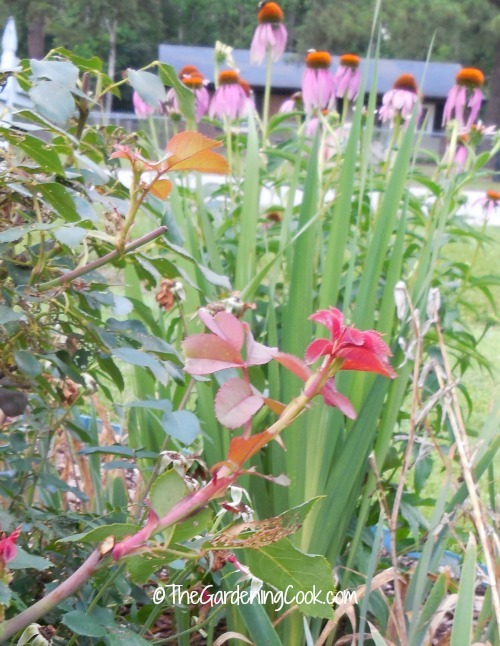 Done correctly, pruning will add to the beauty of any garden perennial or shrub. But done incorrectly, one might just as well not bother at all. Nature is a great leveler. Plants often go year after year with no actual pruning at all. But at some point, natural pruning does occur. It may be just the fact that higher branches shade lower ones and the nutrients can’t get to the lower areas, resulting in them dying off. It could be that animals will chew on tender shoots too, so that the plant gets shaped in some form. It could be storm damage. Nature has many ways to keep things in check. But in our gardens, we have to do the work of nature. 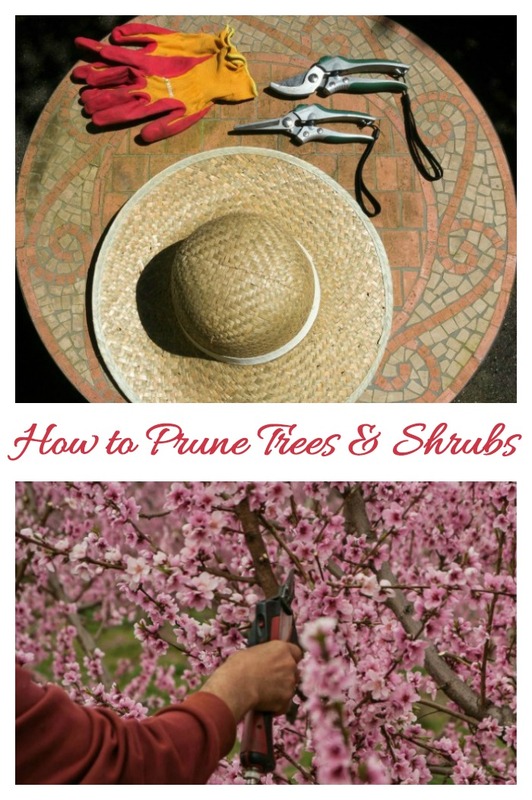 By knowing when to prune and how with these pruning tips, we can make sure that the plants and shrubs in our gardens will flourish. 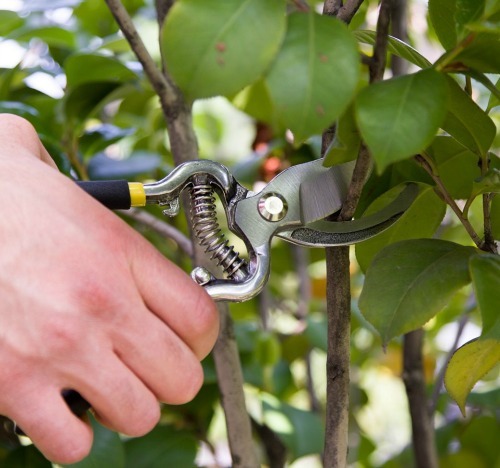 Before you can make the most out of these pruning tips, you need to know why it is important. Pruning promotes the overall health of a plant and removes dead or diseased parts of it. It encourages flowering and growth and helps to keep plants in your garden to a manageable size. Pruning also trains the plant to grow as you would like it to. Try to get in the habit of pruning each year. If you let a plant, shrub or tree get overgrown, it can be a huge task to fix the problem, but if you prune regularly, you will be able to keep your yard and plants under control. A good example of why to prune are these two butterfly bushes. One was pruned very early this year before the growth started. The other was not pruned at all until later in the year. Both were the exact same size plant, planted last year. The pruned one on the right is flourishing, and the non pruned one is much smaller and less lush. It lost out on all the growing time when the bush is sending out new shoots. Both are also planted in exactly the same spacing on my garden bed side so the difference is obvious. My husband now says that he wishes that he had read my pruning tips last year instead of now! Not all plants are pruned at the same time of the year. If they were, we could just follow a schedule and clip away. Also, most new trees and shrubs should not be trimmed for the year after planting, unless you have broken or damaged branches. 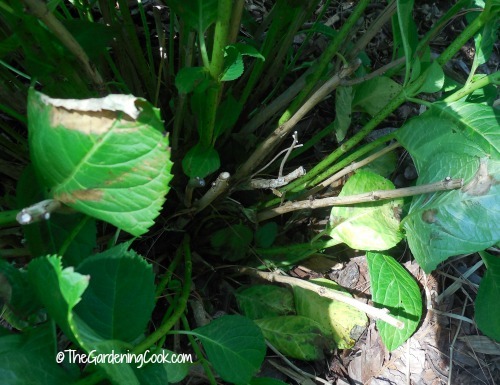 And some shrubs really do not like to be pruned at all (ask my husband who gave our Red Bush a big trim….he is STILL talking about how he killed it!) I have seen other red bushes around the city in the same state. They really do not like to be cut back. 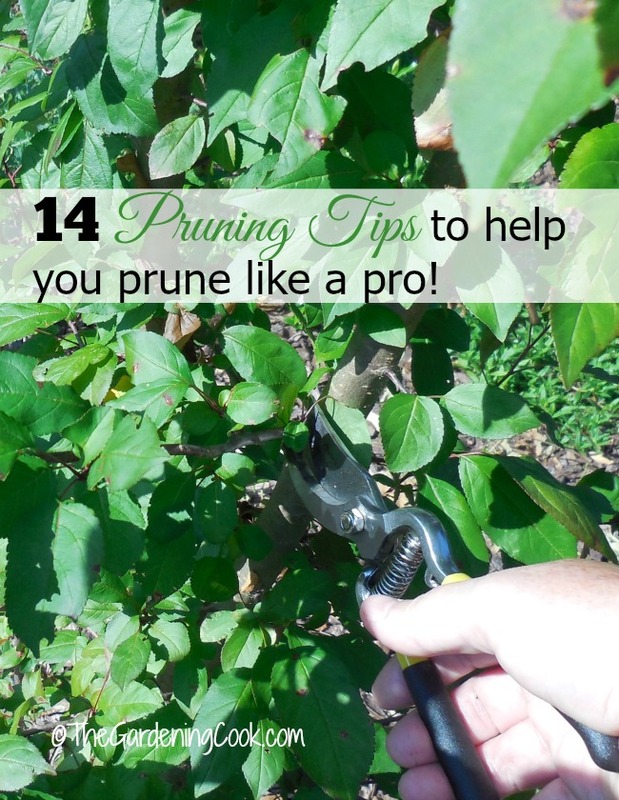 The above tips are general things to do when pruning but these are some things you should NOT do. Don’t prune any tree the first year, unless you are removing dead branches or those that have broken off. Don’t prune near electrical lines or a utility conductor. Call in a pro for those jobs. Don’t remove too much plant during the growing season. If you do, the whole plant may die. Don’t try to prune with a chain saw and ladder. This is also a job for the professionals. No list of pruning tips would be complete without some ideas for the correct tools to use. There are several types of tools that can be used for pruning tasks. 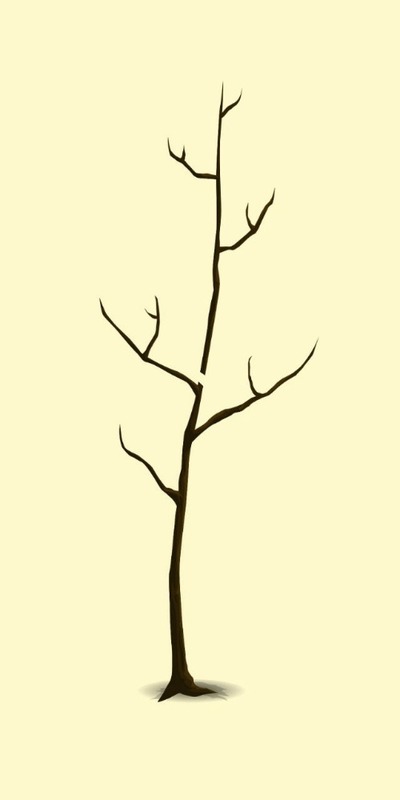 These are best used for small branches, no bigger than 1/2″ in size. Most small plants, perennials and annuals will be pruned with these tools. This is the tool that I use most of the time so I make sure to have a durable set on hand. These Bypass pruning shears from Planted Perfect were a great addition to my tool chest this year. (affiliate link) They are razor sharp with a 2 3/4″ cutting blade made of high carbon steel. The shears are easy to use and comfortable in the hand too. These pruners have much longer handles and a bigger pruning head area. They are perfect for medium sized branches up to about 2″ in diameter. They give a larger cut without the need for a saw and the long handles make them idea for pruning branches in trees that are not too tall. Sometimes, the canes of shrubs can be long and thick, as is the case when I prune forsythia. The extra length of the handles make it easier to cut the branches even if you are not very strong. 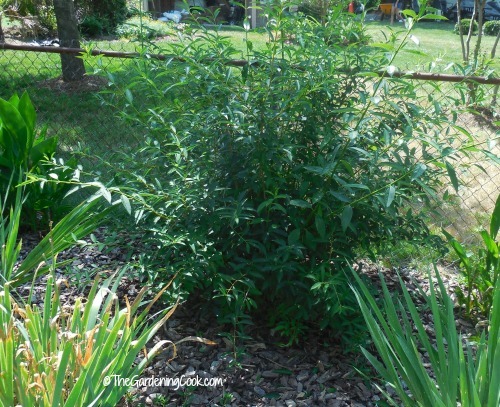 Lopping shears also come in handy when you are doing major renovation pruning or hard pruning of this shrub such as forsythia. Also known as long reach pruners. 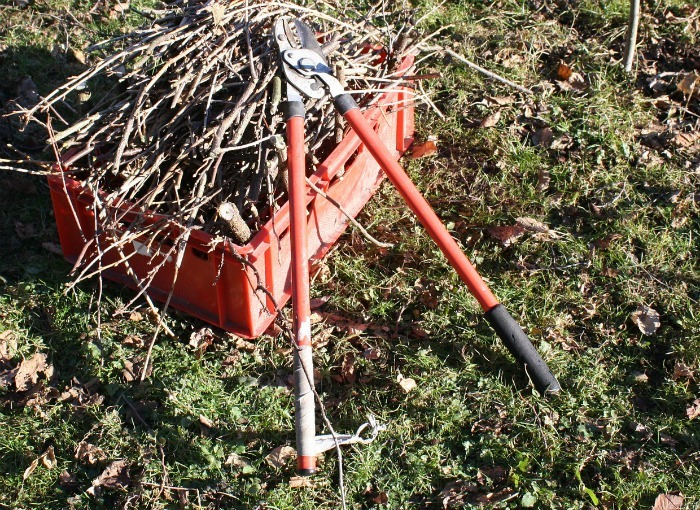 These handy tools are a combination of a lopper and saw all in one with a pull rope to aid with the branches. Pole cutters have a cutter with a hooked blade above and a cutting blade below. The cutter is on a pole and operated by pulling a rope in a downward direction. These can be dangerous to use, so care should be taken when using them. These trimmers have longer handles and long blades too. They are perfect for trimming hedges. They come in both manual and electric versions. 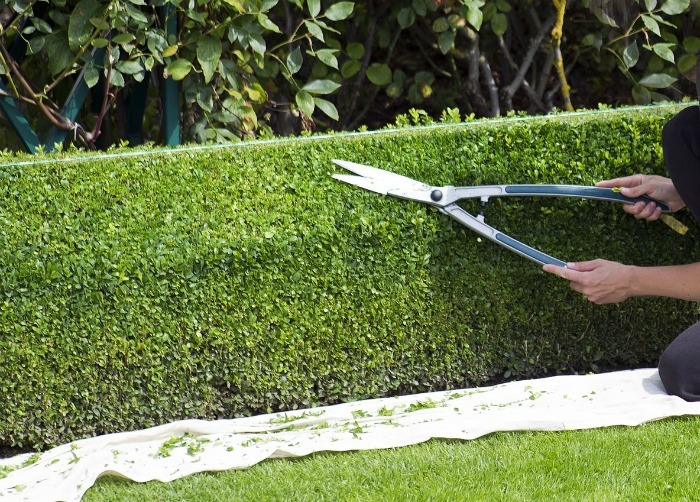 The long, flat blades give a nice flat surface to the trimmed hedge. Adding a sheet or layer or plastic under the area of the hedge where you are working makes it easy to dispose of the hedge trimmings when the job is finished. Larger branches and trees will normally require the use of folding saws or bow saws. Sometimes, in the case of large trees, there is no option except for getting out the chain saw. If the diameter of the cuts is very large and a pruning saw or normal hand saw won’t do the job, then a chain saw might be needed. 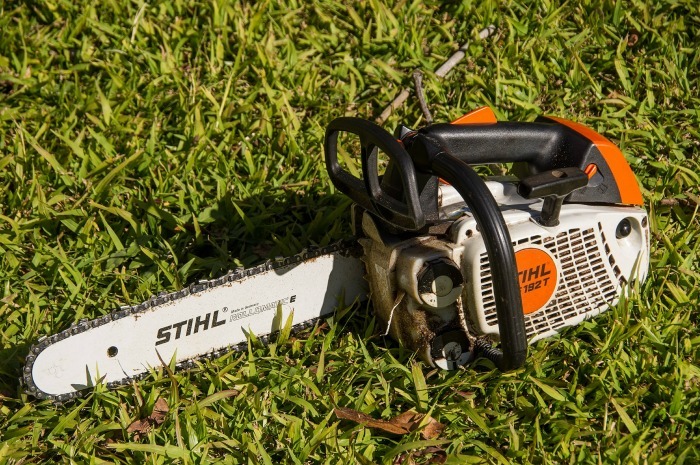 Chainsaws come in both gas and electric models. Gas chainsaws are heavier and require mixing of gas and oil. Electric have to have a cord plugged in but may be better for basic yard work. They don’t work as well on the larger branches, however. Since this may mean that you will need a ladder to complete the job…think about calling in a pro! Pruning is not just a matter of cutting some of the plant off and hoping for the best. Some plants are very particular as to how much and when to prune. These tips are general tips for most plants. 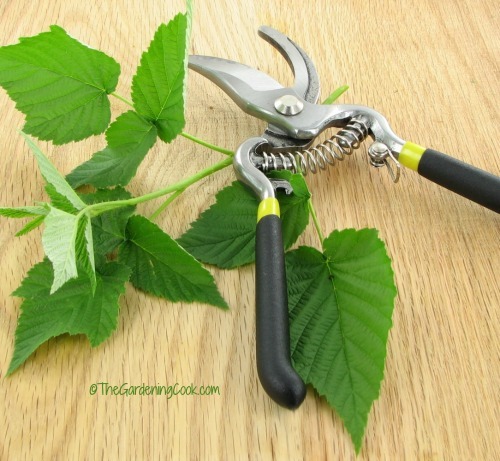 One of my pruning tips that can often be ignored is not pruning correctly. Pruning is more than just taking your tool and cutting a branch off. Where you place the cut matters and how you make it matters too. Keep in mind the shape of the plant when you make the cut and how the branch will grow after it is cut. I normally try to make sure that the new branches will grow out, after the cut is made, not inward towards the center of the plant, while still making a few cuts to be sure the center stays filled in. This results in a nicely shaped bush. Cut with the blade on the inside of the tool for best results. The slant of the cut is important too. 45 º cuts are considered very good for the plant. They do a better job of allowing new growth to develop, and are also less likely to allow decay to set into the cut area from water sitting on the cut. Try not to cut too close to a new bud. If you prune too closely, the bud will wither and die. If you make the cut too far away from the bud, you will end up with wood above it that will die and look unsightly. About 1/2″ is good spacing for most shrubs. Should you trim the top of the plant? If you have a plant with a single stem and you trim the top of it, you will encourage side branching but will limit the total height of the plant, or shrub. Keep this in mind before lopping off the top, or you may end up with a smaller plant than you are looking for. In the image below, a single trunk is cut off half way up the trunk. Branches will form on both sides and the tree will be much bushier but also much smaller. It is important to remember this before you cut a single trunk. If you want a lower tree that is bushier, cut the single stem off. If you want a taller tree, prune the side shoots instead. Many shrubs benefit from an overall thinning of them. This means cutting off branches close to the soil area inside the plant. This will let the remaining branches flourish without being too crowded. I do this to my hydrangeas each year and they seem to get more and more lush as the seasons progress. This is perhaps the most important of my pruning tips. If you do this task at the wrong time, you may lose your flowers that year. Most flowering shrubs are best pruned right after flowering. Doing so will allow the buds for next year’s flowers to form and will result in a lovely show the following year. If you wait until too late in the season to prune, you will be removing many flower buds and your shrubs will have fewer flowers the following year. I prune my Azaleas, forsythia and rhododendrons each year in the spring right after they flower, and they give me a magnificent show each year. This forsythia was part of ONE bush that my neighbor dug up and was going to discard two years ago. We rescued it and chopped the clump into 6 pieces. Careful pruning each spring right after flower has produced 6 HUGE bushes along my side fence line that do a pretty good job of hiding the unsightly chain fence. Check out how they looked in the early spring this year! Tip for winter color: Bring the blooms indoors Just trim off some branches in the middle of winter and bring them indoors. Hammer the bases of the stems and put them in water. In a few weeks you’ll have gorgeous yellow flowers while the snow is on the ground outside. See my tutorial for forcing forsythia indoors here. 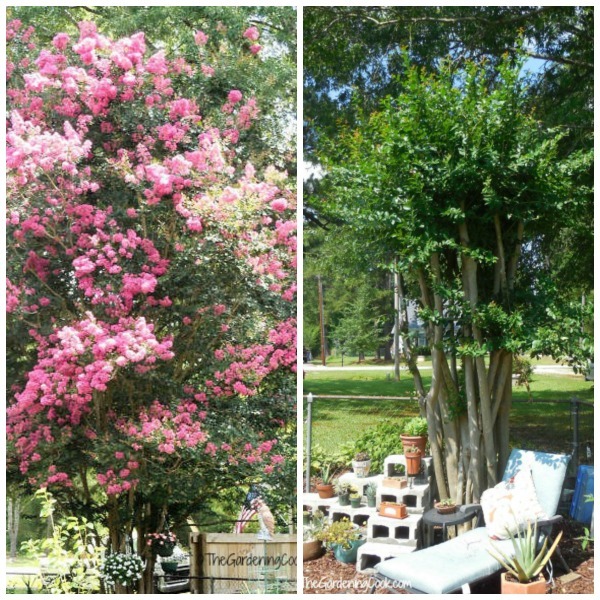 Some larger shrubs that bloom late in the season, such as crape myrtles, butterfly bushes and hydrangeas are pruned later. These are best pruned late in the season to have the most healthy growth next year. (but the same rule apples – after flowering!) 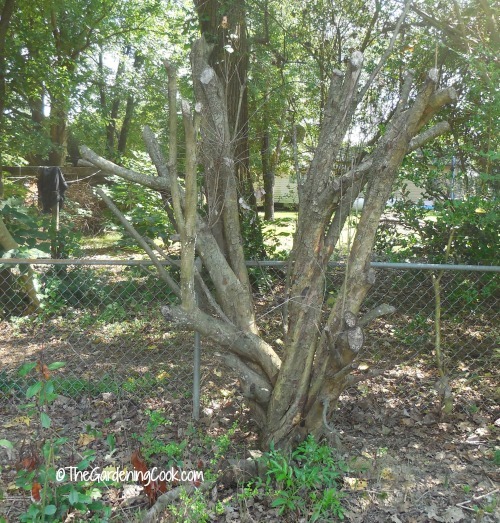 This crape myrtle tree was enormous last year and had never been pruned. We did the job late last year by cutting it down to a little less than 1/2 its size. The tree is lush and full this year and is a much more manageable size that fits the area of the garden so much better. I did prune my box woods this year by more than 3/4 of their size because they were so overgrown and were dwarfing my front entry. But, in this case, I did not care if I lost them. I just wanted to open up my entry area and if they had died, I would have dug them up and replanted smaller ones. 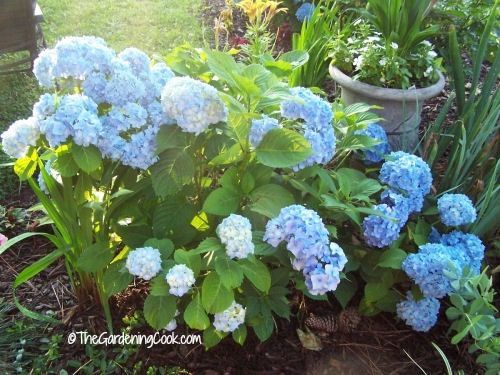 Hydrangeas and forsythias send up new canes from their base each year and the old canes can be unsightly, especially for hydrangeas. To control the size of these, just remove the oldest canes, which are also the thickest ones, on the plant. In the case of forsythia, if you neglect some light pruning each year, you will end up with a messy plant that needs much more severe hard pruning. Time spent each year will save hours of labor later so it is well worth doing. In the example of the hydrangea below, most of the canes can be removed and the plant will do just fine without them even though there are buds on the canes. Remove any dead or damaged branches that you find. They are easy to spot because the color of the branch is a different color and is very dry looking compared to the healthy branches. You can either cut off the entire cane, or if there is some healthy growth below the dead part, trim it above a healthy bud. A general rule of thumb is to remove any side growth on the main canes that won’t be able to sustain a reasonably thick stem on its own. All tiny side branches should go. Make pruning cuts at a 45 degree angle about 1/4 inch above a leaf axle that has a dormant eye. This allows the water to run off and helps to make sure that the cuts don’t become decayed. It is best to trim on the outside of the canes so that the center of the bush has good air circulation. Trim away suckers that form at the base so that the nourishment for the bush stays in the main stems. 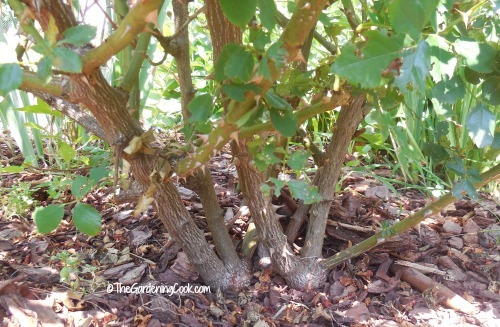 This rose bush is very large and has some generous sized canes, but I trim away all of the small suckers that form to keep the size and condition manageable. 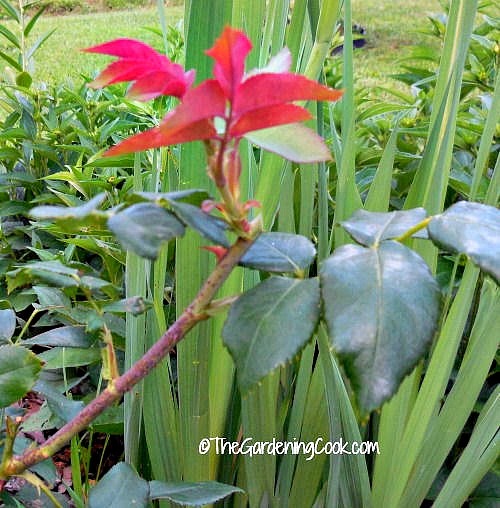 It is important to prune your rose bush so that the center is slightly open. This allows for good air circulation, which will mean less disease on the rose bush. How many canes to leave? The number of canes that you leave will determine the size of the overall plant later in the spring. Severe pruning to just 3 or 4 canes will mean that you get fewer blooms, but they will be larger. Try to keep the top of the hedge slightly smaller than the bottom so that the lower branches are not shaded. You can shear the hedge up to about 6 weeks before your first frost, but then you should stop to allow protection of longer growth during the winter. Many perennial shrubs can be trimmed into hedges but flowering shrubs such as forsythia will have far less flowers in trimmed into a hedge. Evergreen shrubs work best. 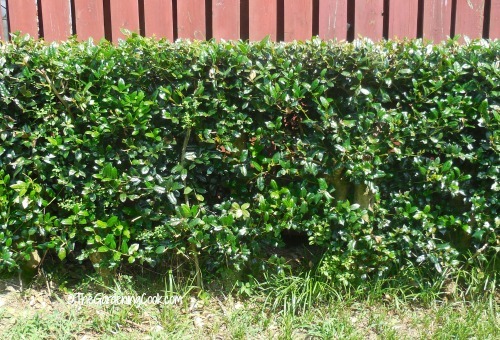 This holly hedge was three large bushes that were very round in shape until last year. We trimmed it half way last year and then cut it down another half this year and it makes a great looking hedge. 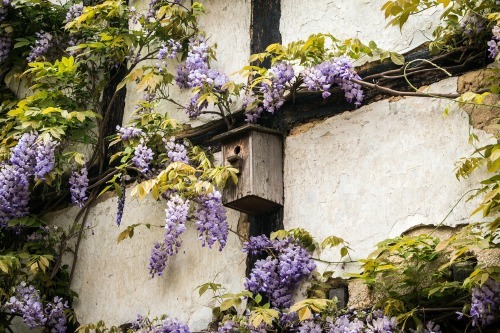 Overgrown vines such as wisteria and trumpet vines can become very unsightly if they are not pruned each year. Remove straggly growth but leave the vines that will climb. Cut off the top of the vines to encourage more side shoots and a fuller plant. It is safe to prune 1/3 to 1/2 of most vines without hurting the overall plant. You won’t have great luck in your pruning chores if you don’t take care of your tools. They should be cleaned and oiled regularly. You can do this by wiping an oily cloth onto the blades and metal surfaces. Keep the cutting edges sharp by running them over a few times on a good oil stone. Treat the wooden handles with linseed oil and repaint or varnish them if necessary. Use them as they are intended. Don’t cut wire with pruning tools and be sure to use the right size tool for the job so as not to strain the parts. See more tips for caring for your tools. Follow these pruning tips this year and you will make sure that your plants, shrubs and hedges are the talk of the neighborhood! If you would like to be reminded of these pruning tips later, pin this image to one of your gardening boards on Pinterest. Note: I received a pair of these bypass pruning shears from Planted Perfect in exchange for reviewing them as a part of this blog post. I recommend them highly. I have fairly large hands and they fit my hands perfectly and are comfortable and easy to use. The owner of the company has a great opportunity for my readers too. Admin note. This post first appeared on the blog of August 2015. I have updated the post with a table of contents, new photos and additional information. Awesome article Carol, love hearing an expert’s opinion on our shears! Thanks. I only experiment at gardening and we are at a stage where some know-how is a good idea. I sure could use these….mine are a bit old, well, they’re very old to be honest with you. Thanks Maria. I took your address out from the comment on my blog for privacy but have made a note of it. Thanks for signing up guys, hope you love our pruners and can’t wait to hear what you think! And we actually have a new product launching soon, mini pruning snips perfect for flowers, herbs and stems and need to find a few testers…not sure if you would be interested but expert opinions and help trying out our products are always appreciated (we do 50% OFF :)! Hi Carol, you did a great job of explaining all about tree pruning! My favorite part of this article is when you said that pruning will add to the beauty of any garden perennial or shrub. I am going to share your post to my mom, she is a garden lover like you. I am sure she’ll subscribe and follow you! Have a great day! It’s really great that you mentioned how different plant species prefer different pruning schedules. My dad is looking for a new hobby, and he’s thinking of getting serious with his gardening. I’ll definitely share this article with him so he could research what time would be best for trimming the kind of plants he currently has. My wife tends to a lot of trees in her garden. I want to help her get them into shape before the last leaf falls, so I researched for ways on how to take care of them. I did not know that pruning can not only remove dead or diseased parts but can also manage flowering, growth, and height. Most of our trees are bare at the moment. With this, I will find a service as soon as possible, so that her trees will bloom well during spring while making our home lovely at the same time. The excellent informative post you have shared on this page about the pruning prunes hand vs mechanical pruning because the Prune trees are pruned to thin fruit wood, improve fruit size, reduce alternate bearing and control tree size and shape. Selective hand pruning with ladders and loppers, one of the most expensive cultural practices, has long been thought best because the selectivity cannot be matched by mechanical pruning. Previous studies of mechanical pruning have shown pruning severely enough to achieve equal fruit size and value per ton as hand pruned treatments resulted in reduced yield. Increasing labor costs and new developments in mechanical pruning equipment have increased interest in pruning strategies that incorporate cost effective mechanical pruning strategies. I agree that proper pruning is the key to a lovely looking garden. My husband’s family house has been abandoned for years, and we are planning to renovate it next month. We’ll have to do beautiful landscaping and tree pruning to bring back its life.